Chef Deborah VanTrece (@chefdeborahvantrece) is the owner of Twisted Soul Cookhouse and Pours in Atlanta, and executive chef and owner of The Catering Company with VanTrece. Tiffanie Barriere (@thedrinkingcoach) is a freelance mixologist who actually made drinking at the airport cool when she was working at One Flew South at the Atlanta Airport. Deborah and Tiffanie are part of a project called The Cast Iron Chronicles, which aims to bring attention to the accomplishments of Black women in the food world. Sonja Overhiser (@acouplecooks) of A Couple Cooks is an author, recipe developer, blogger, and podcaster who has dedicated her career to healthy and sustainable eating. Sonja is based in Indianapolis, where she lives with her husband and work partner Alex, and their son Larson. 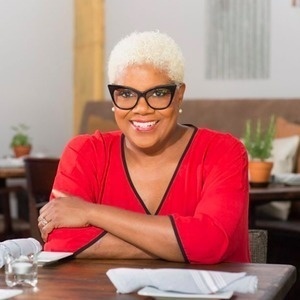 Sonja is unique in the food world in that she uses her platform to connect with other women about subjects such as infertility and adoption. Sonja and Alex’s first cookbook, Pretty Simple Cooking, is out now. Thank you to Emmi, the maker of delicious cheeses from Switzerland, for supporting Radio Cherry Bombe. Visit emmiusa.com for more.